The Books for Walls Project: Guardian's Book Swap is On. Guardian's Book Swap is On. How about a guarantee of 15,000 free books, plus and endless possibility of more --to be found anywhere! 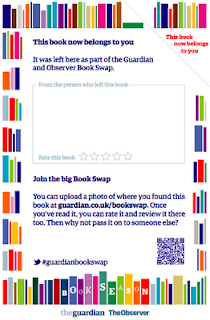 The Guardian and Observer Book Swap promises just that, and more, during "Books Season". Here is the scenario... on a lovely stroll through London, a quiet bench beckons you, on that bench is a book. You pick it up, open it to find a bookplate that says "This book now belongs to you"(see figure A) with a lovely note from a complete stranger. The Guardian even provides a map if you want to cut to the chase! and palace to post photos of the books you've left. The books are just waiting for you, all over the UK --aren't you tempted. Learn how to take part, click here. The Book Swap is Great: pass it on... "a chance for writers, readers, publishers to indulge in a grand act of recycling by taking a favourite book, inserting a tribute to its greatness, and leaving it in a public place to be found by someone new. This isn't a club exactly, more a secret society; a chance to quietly pass along a book you have loved to a perfect stranger" explains Laura Barton. "And in an increasingly virtual age, book swapping offers a rare treat: a real book, left by a real person, simply celebrating how wonderful they found it to be." Read more. We're working on connecting with friends across the Atlantic to help us take part. Interested in helping us? Send us an email. The Books for Walls Project will ship you a book, all you have to do is put it in a fun place in England --The Sisters have a few requests-- take a photo and help us tell the story --how fun is that? Happy Reading, how about taking a challenge? Click here and take one, or two, or all of them! OOOOOO, I will call my Aunt who lives there and ask her today!!!!!! You guys are always thinking of fun stuff! Can we have a Books forWalls field trip to England? I love the idea of this, but I have yet to plan my trip to England (darn!) I wish we could do something like this locally! We were just hatching a plan to have a BFWP Book Swap --watch for it! Say 2012? Book Crossing has been around for more than a decade and is similar in terms of leaving books in public places, mapping, a bookplate explaining that it's free for the taking, and encouragement to release it back into the wild. A few years ago, BC books were showing up in TC and other northern MI cities (Cuppa Joes at the Commons. A Univ. of Chicago Law prof. released a bunch of copies of a text he was using in a class. That one had a link to the course with a request to share crime statistic data for your community. It was found on public transit. Great fun, especially the mapping of the books' travels.